Dandolo 2 A special Chess variant. 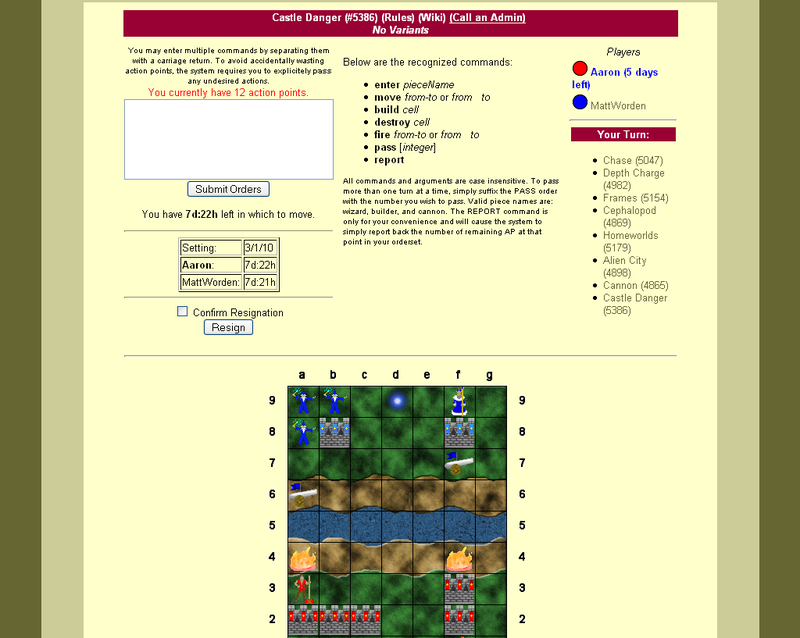 papa_bear 2 Castle Danger seems to have been fixed now (the first-player advantage used to be decisive). Accordingly, I rate the game very highly again. From the simple concept of balancing space and mobility, Matt Worden has developed a great game of planning and strategy. Aaron 1 I do not play this game very well, but it is an excellent abstract. I highly recommend it. CDRodeffer 1 Fun light war game that plays in about 40 minutes over the board. Keith 1 Another game with clever mechanisms from Matt. Here the balance is between space and action points. The game had too much of a first person advantage. Not only has this been addressed with a rule change but the fix adds tactical considerations that deepen the game. unic 1 Very clever abstract. I have some worries about first-player advantage and stalemate situations. Cerulean 0 I want this game to be a siege, but it's over in just a few turns. It's no small feat to turn the game around once you're behind. Draw5PlayAll 0 Good in theory, but the Wizards Must Wait is broken and the walls can be moved like any other piece even with no builder around. morganfitzp 0 Cool balance of strategy, though playing it sometimes makes me feel like I'm beating my head against a wall. nycavri -1 Attractive but claustrophobic. I do not enjoy the long command strings. Likely plays better over a board.